Daniel Levy is trigger-happy and changes managers like other people change their socks, but he is almost patient compared with some blood-thirsty Spurs supporters. Do the lynch mob honestly think kicking out the third manager in less than a year is the answer to Tottenham�s problems? AVB was axed 12 months ago next week. Tim �The Intimidator� Sherwood was shown the door in the summer, and now there are widespread calls for Pochettino�s head on a plate. It was not that long ago that Harry Redknapp was hounded out of the Lane after giving Spurs fourth-fifth-fourth finishes. How on earth will the club ever get any continuity if the manager is forever looking over his shoulder for a knife between the shoulder blades? If the players performing so tamely under Pochettino had been signed by him, I�d be joining in the chorus of disapproval. But he inherited this playing staff, and 15 Premier League games are hardly enough for him to have got his ideas across to what is literally a team of passing strangers. What is it about the keyboard that it turns the butcher, the baker, the candlestick maker into an armchair manager, who knows better about tactics than somebody who had a distinguished playing career for club and country? Let�s all try to pull together and get behind Pochettino and the team. Booing the players off is almost traitorous in my book. No wonder Adebayor says they would rather play away. White Hart Lane used to be a fortress. Now it�s becoming as welcome as a bouncy castle for visiting teams. The spirit of Spurs is being squeezed out of the Lane by a minority of loud-mouthed supporters, who have become like the enemy within. Don�t they realise what they are doing to the team morale by their verbal (and on line) abuse? What sort of support is that? I tried defending Mauricio on line, and was called Canute or something like that. He�s hopeless, useless, clueless were among the kinder criticisms. And the players, praised a short while ago for their performance against Everton, were savaged for being over rated and over paid. I have left out the crude adjectives that some on line seem to think empowers their argument. Yes, the players are getting shedloads of money, but barracking them is not going to help them earn their corn. I wonder if the boo boys set perfectionist standards for themselves at their workplaces? Yes, I�m a Canute. Anybody who watched the BBC�s Match of the Day filleted version of Saturday�s game will be convinced Palace monopolized the action. Yet the stats show that Spurs made 500 passes to the 174 by the Eagles. The problem is that too many of the Tottenham passes were of the tippy-tappy variety, and it was obvious the players did not have the confidence to be thrusting and positive. That�s one of the effects of a section of the crowd getting on their backs. Those of a certain age will join me in mourning the passing of traditional wing play. We thrilled to the touchline runs of the likes of Walters and Medley, Dyson and Jones, Robertson and Neighbour, but on Saturday there was no width to our attacks until Aaron Lennon was called off the bench much too late. It is going to be interesting to see what Spurs do during the January transfer window. There could and should be a huge clear out of the dead wood, and hopefully an influx of players who can be positive in both penalty areas. My fear is that Hugo Lloris, our one world-class player, will get so fed up having to pull the team out of trouble that he will seek pastures new, where he will have defenders able to give him the cover and support he deserves. The In-the-Knows are already out in force on line forecasting which players are coming to the Lane. Just remember that in the summer they gave us the names of 64 players who were on their way, and not one of them arrived. I just hope Pochettino is not included in the exodus. He deserves the chance to pick a team of his own players. But the keyboard coaches will, of course, know better than Mauricio what the team needs, without understanding a thing about the temperament, personality and fitness of the players they select from the comfort of their chairs. Pochettino has a plan. Now he just needs the players who can put it into operation. Upcoming is a tricky trip to Besiktas on Thursday followed by another banana-skin match at Swansea on Sunday. Let�s stop all the civil war squabbling and give the team the support it needs. Otherwise we will manufacture a crisis that could blow up in our faces, and Daniel �The Axeman� Levy will be playing the executioner again. Let the Poch manage and get behind him, not in his way. Find somewhere else to stick the Alan Sugar �You�re fired� fingers. I make no apologies for repeating my �commercial� for my latest book � Spurs IQ � because a donation for every copy sold is going to the Tottenham Tribute Trust to help our old heroes who have hit difficult times. You need to order it NOW from http://www.normangillerbooks.com/spurs-iq/4554925859 if you want it for Christmas. The book is part Spurs history and part examination for quizzical White Hart Lane supporters, and has been inspired by readers here of my weekly blog on what many consider the No 1 Tottenham Hotspur website, Spurs Odyssey. 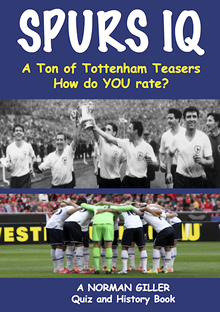 As you know, I set a regular �Giller Teaser� and several who take part in the competition have told me they would like a book of teasers to test their all-round knowledge of Tottenham Hotspur. So here it is, the 98th book from the Giller quill. I have called it Spurs IQ, because it gives a thorough test of your memory and know-how of all things Spurs and also serves as a journey � even an odyssey � through the Tottenham ups and downs of the eventful post-war seasons. Tottenham Teasers are running throughout the book in unison with tales of the club�s ups and downs, and there is a Spurs IQ ratings table at the end that will give you a measure of your knowledge of the club, along with a Spurs IQ Masterclass test on the Legends of the Lane. I hope you will show true Spurs spirit and give your support to The Tottenham Tribute Trust and our old heroes from the glory-glory days. Last week I asked: Which goalkeeper captained Tottenham in two matches, and once scored a goal against Watford? He won 41 international caps. Most of you got it right, Paul Robinson, who never fully recovered from his nightmare mistake that led to an embarrassing own goal in Euro 2008. In my opinion he deserved a longer run as the last line of defence for Spurs. The first name chosen at random from the correct entries: Brian Richardson, of Reading, who wins the autographed copy of Lane of Dreams. This week�s teaser: Who scored 34 goals in 299 League games for Tottenham, was given the first of 30 England caps by Terry Venables, and also played for Portsmouth, Birmingham City, Wolves and Bournemouth?